Georgia Secretary of State Brian Kemp (R) led Abrams 51 to 48 percent with 97 percent of precincts reporting when Abrams made her speech. 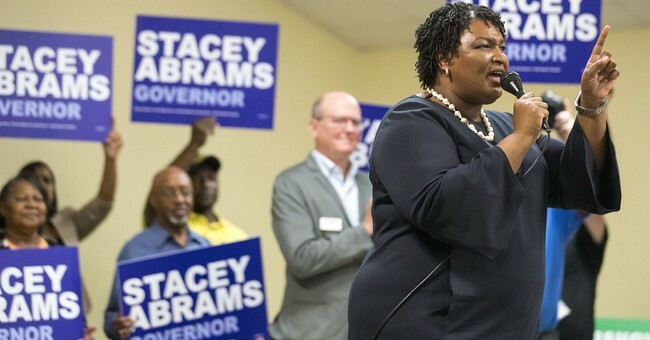 Democratic gubernatorial candidate Stacey Abrams' campaign disputed on Saturday her opponent Brian Kemp's claims that there are not enough outstanding provisional ballots for Georgia's governors seat to trigger a recount or runoff election. Abram's campaign said their findings show a total of 26,846 provisional ballots are uncounted as of Saturday morning. Meanwhile, Kemp's campaign said 21,190 provisional ballots are still outstanding. If Abrams is able to gain slightly more than 23,700 votes on Kemp, the race is pushed into a mandatory recount. If she can gain about 25,600, it is forced into a runoff. The Democrat is hoping that once all the votes are accounted for, her opponent's vote share drops below the critical 50 percent threshold, which would trigger a runoff election on Dec. 4. Kemp said Thursday that even if Abrams received "100 percent" of the remaining provisional ballots, he would still come out on top. Abrams' campaign lawyers filed a lawsuit Thursday over absentee ballots in the state's Dougherty County. Groh-Wargo said Kemp owes the people of Georgia "an explanation" for why accurate and complete information was not being provided. "We need to see lists, we need to see names, we need to see counts of every vote," she said, later adding that the campaign would not stop pressing forward "until we are confident that every vote has been counted." U.S. District Judge W. Louis Sands said that the county must accept all absentee ballots received by Friday and will not certify the results of the election until Tuesday, according to the Atlanta Journal-Constitution. The Democratic Party of Georgia tweeted Saturday evening that a "handful" of Georgia counties reported thousands of "new" absentee, early, and Election Day votes not accounted for by Republican candidate Brian Kemp. The latest vote tally on the Georgia secretary of state's website shows Kemp leading by more than a percentage point. Kemp had 1,975,806 votes to Abrams' 1,916,931 -- a margin of 58,875 votes -- leading 50.28 percent to Abrams' 48.78 percent. The Libertarian candidate, Ted Metz, had a mere 37,149 votes and 0.95 percent of the vote. Yeah, I’ll let you debate among yourselves about all of these “new” ballots keep popping up.